Western governments lined up to condemn "disturbing" new charges. LONDON (AFP) – Western governments lined up to condemn “disturbing” new charges brought against Myanmar’s pro-democracy icon Aung San Suu Kyi on Thursday, but there was a deafening silence in Asia. Gordon Brown, leader of the former colonial power Britain, said the junta which has kept her under house arrest for years wanted any excuse to extend her detention while the European Union said the move could not be justified. The United States also said it was “troubled” by the development but there was no immediate response from the Association of Southeast Asian Nations (ASEAN), the regional bloc which includes the country formerly known as Burma. “I am deeply disturbed that Aung San Suu Kyi may be charged with breaching the terms of her detention,” Brown said in a statement. “The Burmese regime is clearly intent on finding any pretext, no matter how tenuous, to extend her unlawful detention,” he said. The 63-year-old, who was stopped by the junta from taking power after winning elections two decades ago, has been charged with breaching the terms of her house arrest after a US man swam across a lake and hid inside her home. She will go on trial on Monday on the charges, which carry a maximum jail term of five years and would stretch her detention past its supposed expiry date this month and through elections due in 2010. The Nobel Peace Prize laureate and her two maids appeared in court at the notorious Insein Prison near Yangon, hours after police whisked her away from the residence where she has been detained for most of the past two decades. Piero Fassino, the European Union’s special envoy to Myanmar, said there was “no justification” for the decision to charge her. French Foreign Minister Bernard Kouchner and human rights minister Rama Yade issued a joint statement condemning the arrest “in the strongest terms”. “This decision is all the more unacceptable given the Nobel Peace laureate’s state of health which has deteriorated over the past several days,” they said. In Norway, where Aung San Suu Kyi was awarded the Nobel prize in 1991, Foreign Minister Jonas Gahr Stoere said he was “disturbed” by the charges and demanded her immediate release. And in the United States, the State Department said Secretary of State Hillary Clinton had asked for more information on the “troubling” developments. “We have seen this report, which is certainly troubling if true,” spokesman Ian Kelly said. The chorus of official condemnation in the West however was in sharp contrast to the reaction in Asia. Calls and emails to the Jakarta secretariat of ASEAN were not immediately answered and there was no immediate official reaction from Myanmar’s eastern neighbour and ally China, nor any Asian governments. ASEAN has long been wary of criticising Myanmar but the 10-nation club has found itself embarrassed by the regime, led by the reclusive General Than Shwe. During an ASEAN summit in Thailand last month, Myanmar threatened to boycott a meeting with human rights advocates if a Myanmar activist was present. The activist was not allowed into the session. At the summit, leaders urged Myanmar’s junta to move towards democracy but Aung San Suu Kyi’s name was never mentioned. In Japan, dozens of pro-democracy campaigners rallied to demand her release. 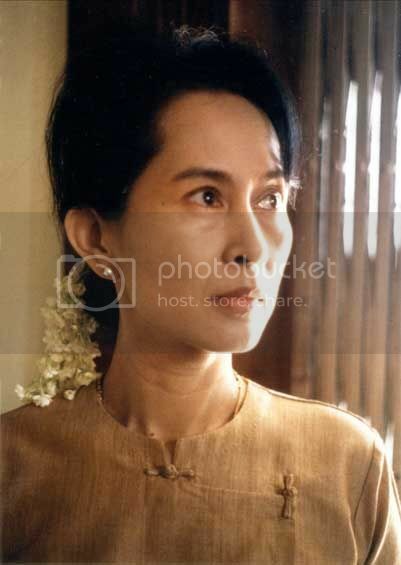 This morning Nobel Peace Prize Recipient Aung San Suu Kyi was moved from her Rangoon home to Burma’s notorious Insein Prison, where she will face trial on Monday for supposedly violating the terms of her house arrest by hosting an unauthorized visitor after an American man swam uninvited to her compound and refused to leave. Aung San Suu Kyi has been under house arrest continuously since 2003 and for a total of over 13 of the past 19 years. According to the State Protection Law, under which she has been held, she can be detained for a maximum of six years. This period was due to expire in less than two weeks, on May 27th, 2009. Now, the military junta is using trumped up charges stemming from the incident of the American swimmer to extend her detention. Suu Kyi was the victim, not the perpetrator, of this crime. For more information, please read USCB’s press release from earlier today. The crime for which Aung San Suu Kyi is now being tried carries a minimum prison sentence of three years. This is a critical time for the military regime in Burma, which has faced great difficulty in gaining support for its plan to host elections based on a sham constitution in 2010. We must take action to ensure that the regime continues to feel pressure from the international community. 1.) Email UN Secretary General Ban Ki-moon and urge him to send his envoy to Burma and to take a stand for Aung San Suu Kyi’s security and freedom. Click here to send an email to the Secretary General. Burma groups around the world have called for demonstrations in support of Aung San Suu Kyi to be held at Burmese embassies on Monday, May 18th. US Campaign for Burma has organized a demonstration in Washington, DC at 12:30pm on Monday, May 18th, in front of the Burmese military attache (2300 California St. NW, near Dupont Circle). For more information contact Mike Haack at [email protected]. If you are interested in organizing one in your home town, email Mike with the details and he will notify Burma supporters in your area. Participate in Arrest Yourself 2009 and show your solidarity with Aung San Suu Kyi: uscampaignforburma.org/arrestyourself2009. The world is giving more and more attention to Aung San Suu Kyi’s cause. You can learn more about the regime’s detention of Aung San Suu Kyi on the news section of our website, or by reading these articles from CNN International, BBC, Al Jazeera, Agence France Presse, and Straight Times.